Grey skies and the occasional raindrop could not knock the shine off the biggest day of the year at Hastings Racecourse, that being a Derby Day program that featured six stakes races, including the British Columbia Derby and Oaks and the two Diamond Futurities with the S. W. Randall Plate and the Delta Colleen thrown in for good measure. It was an outstanding day of racing. There was a strong local contingent and a number of top class shippers from surrounding jurisdictions. 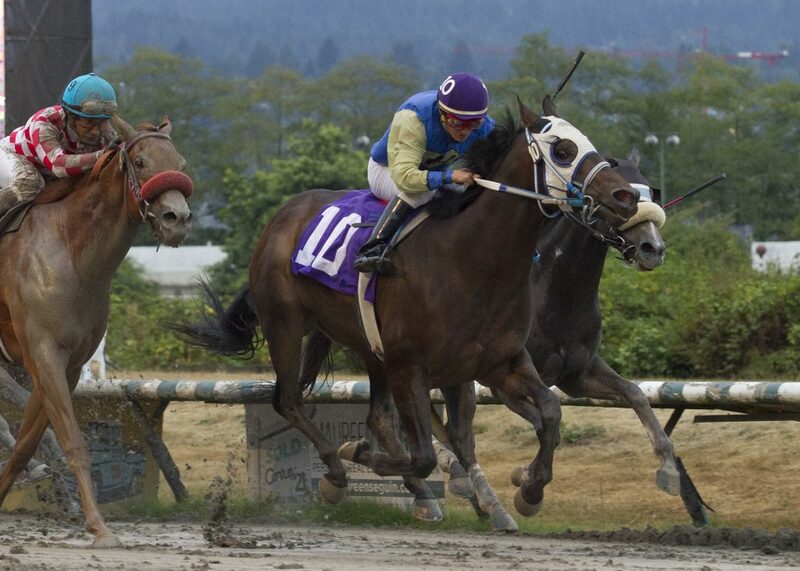 And while the Derby has always been the main event, it was Daz Lin Dawn in the Oaks that illuminated the firmaments with a performance that saw her defeat her local rival, Yukon Belle, and a couple of tough shippers from Emerald Downs who appeared to have much bigger Beyer speed figures. It emerges obvious that the Beyer numbers for Hastings greatly understated the quality of Daz Lin Dawn’s races and even more significantly, they are not capable of measuring heart. Richard “Big Race” Hamel rode Daz Lin Dawn and he won two other stakes on the card, showing up as he so often does when it counts the most. 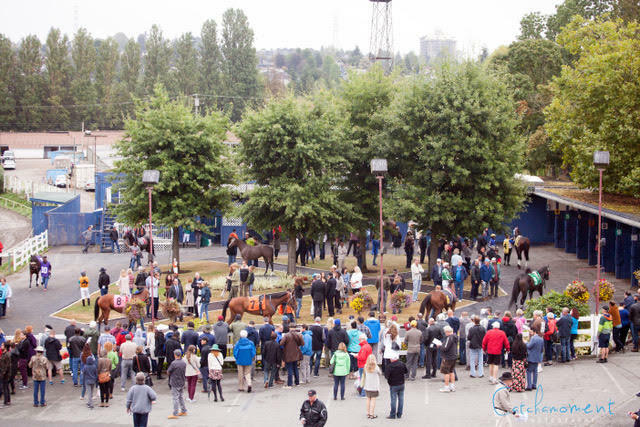 There were some great stories (a $1,500 yearling won the Jack Diamond Futurity, a former $16,000 claimer won the Delta Colleen) out at Hastings today, but the Derby was the feature, so let’s begin with it. 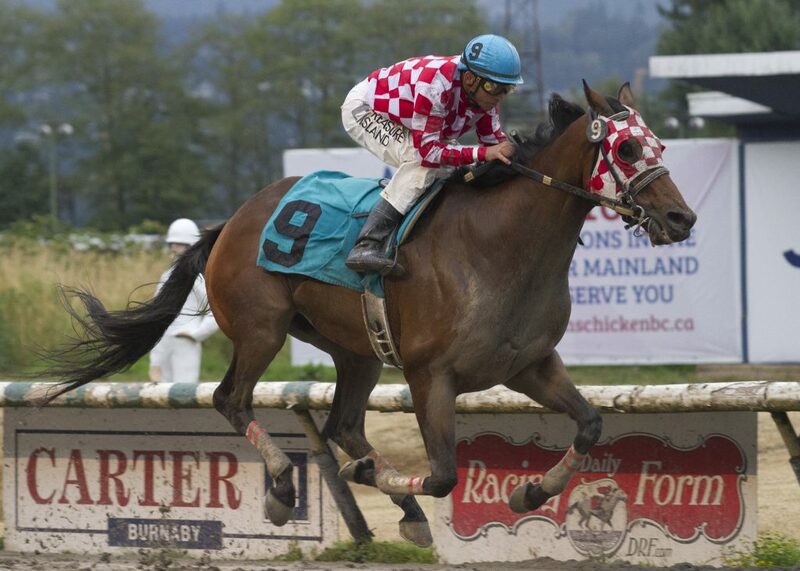 CHIEF KNOW IT ALL Winning the 2017 BC Derby with jockey Rico Walcott up. 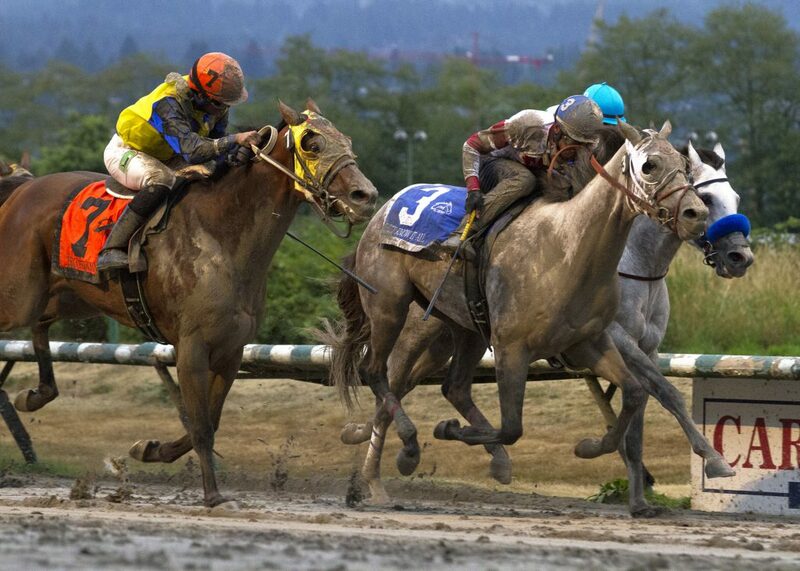 The 72nd running of the British Columbia Derby was a real barnburner that went to Canadian Derby winner, Chief Know It All ($9.50), who found a seam in the lane to hang a nose on Trooper John who was wide for much of the trip and ran way “too good to lose”. The same could be said of Riser who was a neck back in third after setting some serious fractions on a tough track and leading for all but the last couple of jumps. Jockey Rico Walcott saved ground with Chief Know It All for almost all the mile-and-an-eighth journey before angling out in the stretch to split horses with the move that got him home a nostril to the good of Trooper John. The winner covered the mile-and-an-eighth in 1:51.95. Chief Know It All was claimed at Churchill Downs this past June for $100,000 US by his current connections. Chief Know It All’s foray into Western Canada has gotten them out on the horse in two races (the Canadian and BC Derbies). He is owned by Rollingson Racing Stable, Randy Howg, Rick Wiest and Clayton Wiest. Robertino Deodar trains the Kentucky bred son of Flashy Bull. Diodoro has a far-flung operation these days, a successful one at that, and it raises the quality of the local sport to have horses ship in from top outfits who race in other places. Shippers took the first five places in this edition of the Derby. 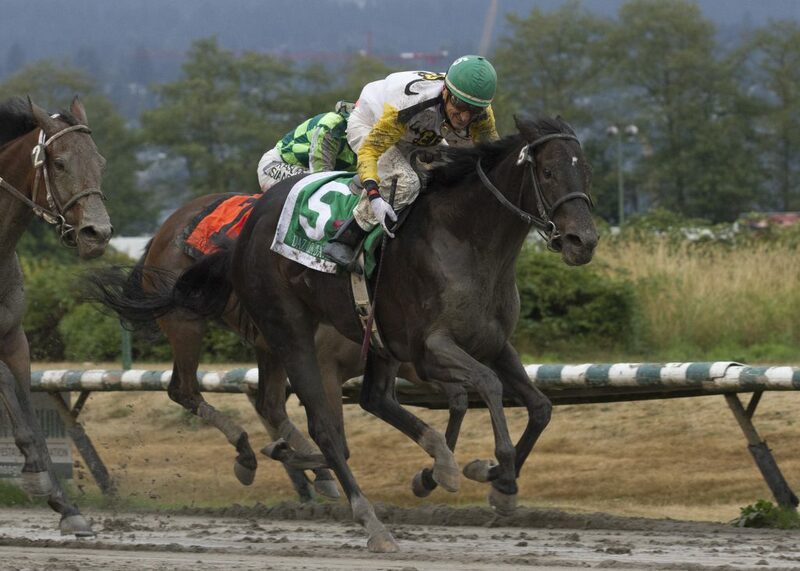 In the centerpiece performance of her career thus far, Daz Lin Dawn ($4.50) defeated a familiar rival and a couple of Emerald Downs Invaders to remain undefeated in 2017, having now won 7 consecutive stakes. Her winning margin of a neck represents the only time this season anyone has gotten closer to her than 3 lengths, but the challenge came not from one of what appeared to be very tough Washington shippers, but from her frequent sparring mate, Yukon Belle who ran her best race of the season to take second. Top Quality finished third, well clear of second-choice Little Dancer who likely took a lot of Washington simulcast money. Daz Lin Dawn ran almost the entire mile-and-an-eight in the three-path while Good Luck to You was setting a pace that was attended by Little Dancer and Top Quality. It was at least mildly astonishing, if not shocking, to see the apparent ease with which Daz Lin Dawn ran around them when Richard Hamel cued her early on the final turn. The only remaining threat came from Yukon Belle whose late run was impressive but insufficient to catch the winner. It was Hamel’s second of three stakes win of the day. He has been aboard for all seven wins this year. Daz Lin Dawn is owned by JDP Holdings Ltd., Nancy Betts and Delton Stable. She is trained by co-owner Nancy Betts. Daz Lin Dawn was bred in British Columbia by John Shone, Jacqui Shone and Samantha Shead. She is by the deceased California based stallion Popular, out of the Meadowlake mare Summer Bay. Summer Bay was a $2.800 RNA at auction in 2011 while in foal to Vronsky. Daz Lin dawn sold for $15,000 in the 2015 CTHS Sale. She was purchased from the Road’s End Farm consignment. It has not been a secret on the backstretch that Here’s Hannah ($2.60) was good, she went off in her first race at a buck-fifty-five to one and ran like it. But it would have been hard to know that she was as good as she looked in the Sadie Diamond at thirty-cents to the dollar, being value at that. 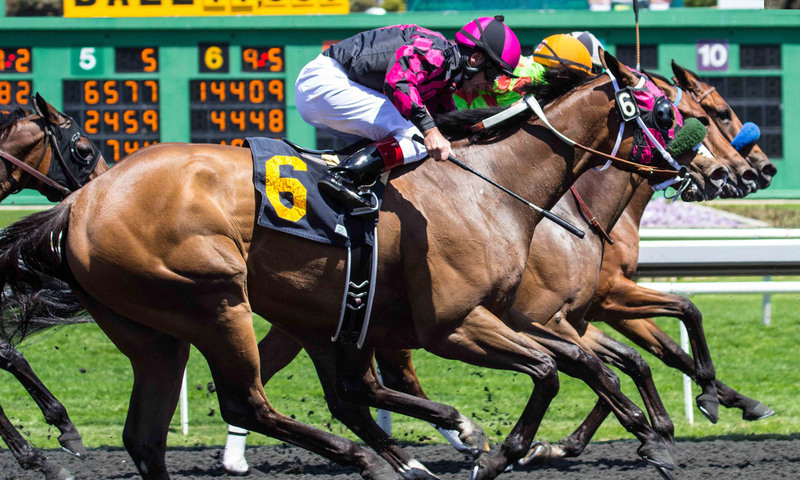 Jockey Richard Hamel hand rode her all the way around, he could have left his stick in the jock’s room instead of carrying like excess baggage in a trip around the 6 ½ furlongs that took 1:18.13, about a half-length slower than the boys would run a few races later. Raider did her best all the way, made a move going into final turn when asked that did not even fizz on the winner, and tried hard to the end but was unable to threaten the winner. Sonoma managed to run third after botching the break, but she was well in arrears to the top two. Here’s Hannah was bred in this province by B. C. Stables. She is by Numaany, out of Dreams Start Here, an unraced A Fleets Dancer mare. Here’s Hannah is owned by B C Stables and Paul Caravetta. John Morrison trains the long-striding chestnut who could truly be any kind. As a daughter of Numaany, out of a mare by the Travers winner A Fleets Dancer, she has a distance pedigree in spades, and for what it is worth, she galloped out all alone, like a horse that wants more. If she stretches to a mile-and-a-sixteenth, as she should, the Fantasy is hers to lose. Fighting just about every inch of the way, Wise Market ($31.00) broke his maiden in the Jack Diamond, getting home a half-length ahead of a closing Pan Handle. European was a neck back in third. Final time for the 6 ½ furlongs was 1:18.02. Wise Market broke from the 10-hole under rider Amadeo Perez, soon hooked up with European who had the rail, and the two of them waged war for all but a few steps along the way. Little more than a head separated them until quite late when Wise Market reached down for more and managed to shake off the very determined European and hold off Pan Handle who, when he figured out a lead change late in the stretch, came up with a burst that almost got him there. But Wise Market was full value for the win. He ran hooked the entire trip in the two-path and showed the kind of resolve you need to win these kinds of races. Wise Market is by Mass Market. His dam, Fuchsia Gold, won the Timber Music Stakes at two and Wise Market has inherited that precocity. He sold in the 2016 CTHS Sale for $1,500. Co-owner (along with Blair Law and Brian Albertson) and trainer Philip Hall purchased him from the Red Rock Farm consignment. Having not won a race since October of 2015, Highway Boss ($26.90) picked a good time to break the losing streak in taking the Randall with a convincing 5 ¾ length victory over the near 40-1 shot Crazy Prophet who in turn was a head better than Neveradoubt in third. Highway Boss ran the mile-and-an-eighth in 1:50.52, roughly 8 lengths faster than the fillies and mares would go one race later in the Delta Colleen. 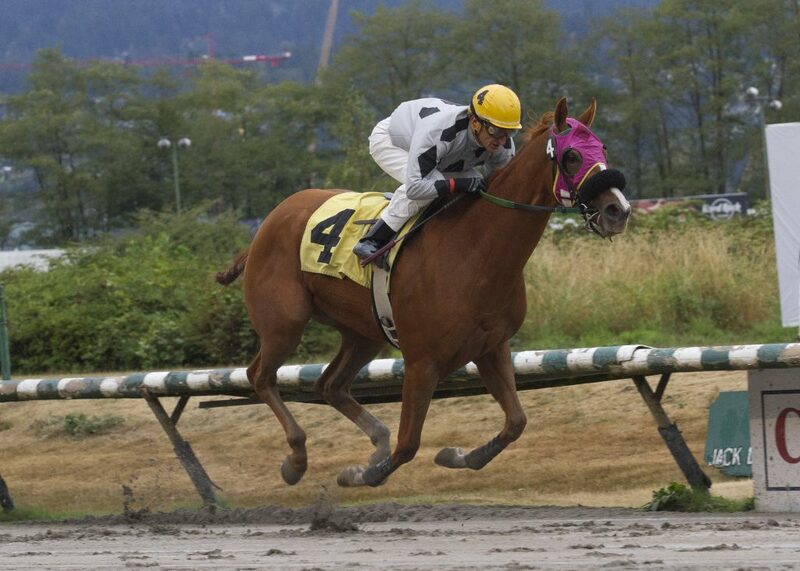 Aaron Gryder shipped in to ride a couple of Emerald Downs horses and two for Glen Todd who he was contract rider for at Hastings in 2013 and it was on Highway Boss that he did his best work. He pulled Highway Boss out of what could have developed into a three-horse speed duel and put the winner in perfect position behind Moon King and Modern who were one-two on the lead in realistic, but not severe, early fractions. Highway Boss stalked the pace from an absolutely classic “catbird seat” position until there was quarter-mile to go, at which point Gryder asked and Highway Boss exploded to the lead, quickly opened up daylight and the party, as the late Dandy Don Meredith often sang, was over. Crazy Prophet closed on the grandstand side to take the place by a head, and Neveradoubt filled the third spot with a run from far back, but they were in a race of their own that never involved the long gone Highway Boss. Highway Boss was claimed at Santa Anita in January of 2016 by his current owner, the North American Thoroughbred Horse Company. The five-year-old gelded son of Street Boss was bred in Kentucky. 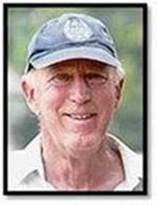 He is trained by Glen Todd. 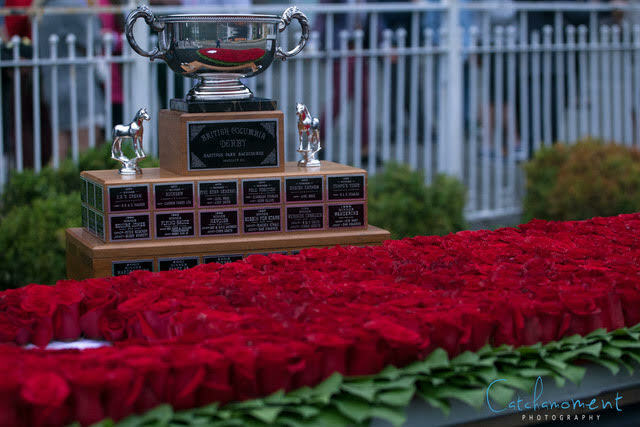 Another version of the Cinderella tale is presented by Notis the Jewel ($16.80) who upset the short-priced favorite and runner-up Victress in the Delta Colleen Handicap. Sailingforthesun finished third after briefly getting to the front in the stretch. Final time for the mile-and-an-eighth was 1:52.19. Notis the Jewel and Victress trailed the field early with Notis the Jewel two or three lengths clear of Victress. They made their moves at about the same time and Victress was never able to close the gap. Sailingforthesun ran third. Richard Hamel provided the well-timed move that greatly assisted the winner’s cause and got Hamel his third stakes win for the day. Notis the Jewel has now won three in a row, the last two being stakes and the third one back being a conditioned $16.000 claimer. Since trainer William McLaren stretched her out this year after three sprints, she has become something other than a mid-level claiming filly. 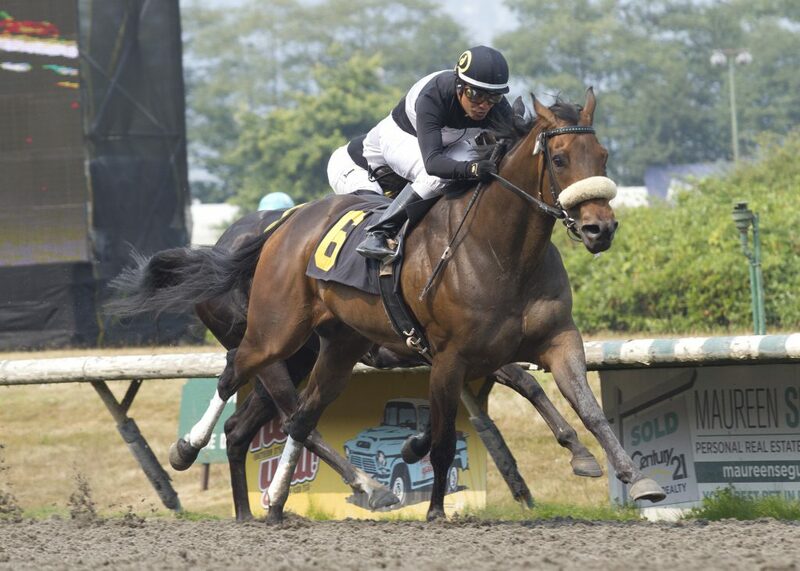 She is now a legitimate contender, having shown that her win in the Distaff on BC Day was no variety of fluke. She made a long, sustained run while holding off last year’s Oaks winner. It was an impressive and well-earned win. William McLaren races Notis the Jewel via lease and she was bred in British Columbia by the long-time BC horseman, the late Len Fielding. The fourth was a Maiden Special Weight for two-year-olds at the “about 6 furlong” distance. It was won by Rogerio ($17.40) with Antonio Reyes getting his second score on the card. Rogerio is owned by his breeders, Tod Mountain Thoroughbreds, and is trained by Mike Anderson. Reyes opened the card with a win on Flaming Youth ($5.40) for owner/breeders Russell and Lois Bennett. Barbara Heads does the training. The second race saw Amadeo Perez kick off his riding double with Santa Fe Trail ($4.80) for owner/breeder Forster Stable, trainer David Forster. Great racing! Engaging wrap up. And congrats to all.